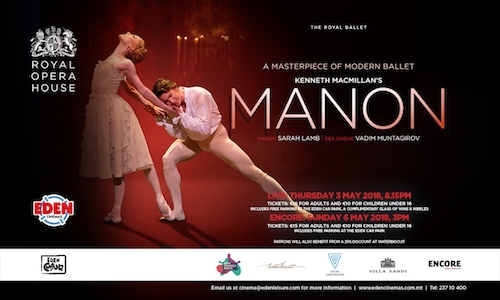 Kenneth MacMillan’s masterpiece of modern ballet, Manon, will be broadcasted live at Eden Cinemas on Thursday 3rd May at 8.15pm with an encore screening on Sunday 6th May at 3pm. A firm favourite in The Royal Ballet repertory, Manon depicts the powerful and obsessive love between Des Grieux (Vadim Muntagirov) and Manon (Sarah Lamb), who, when they first meet, is being sold off to the highest bidder by her brother Lescaut (Ryoichi Hirano). They then elope to Paris only to find herself being seduced by Monsieur G.M (Gary Avis) who entices her to leave her lover for a life of luxury. The ballet was choreographed by Kenneth MacMillan, who took inspiration from the best-selling novel by the 18th-century writer Abbé Prévost. MacMillan perfectly captures Manon’s conflict between her love for Des Grieux and her need for luxury, and uses the whole Company to create a complex portrait of Parisian high life and the squalor of a New Orleans punitive colony. Parking at Eden Car Park for both screenings is free of charge and complimentary Villa Sandi wine courtesy of Vivian Corporation is served to those attending the live screening on 3rd May.